It didn't take long for submarine builder John P. Holland to decide that New York Harbor wasn't the best place to test his designs. While the protected waterway was calm enough, Holland's hope of working without interference was continually torpedoed by heavy ship traffic, curious citizens, and snooping by Navy vessels and foreign spies. So in the spring of 1899, Holland dispatched Charles Morris, chief engineer of the Holland Torpedo Boat Co., to the Greenport area to look for a new test site. Morris recommended a tiny resort community on Cutchogue Harbor, and Holland leased a shipyard. The operation expanded and New Suffolk became the home of America's first submarine base. Holland, a small man who wore rimless glasses and bowler hats and seemed in constant motion, was born in Ireland in 1840. He immigrated to the United States at 33 and became a parochial-school teacher in Paterson, N.J.
His first working submarine, called simply Boat No. 1, was launched in Paterson in 1878. Rebuffed by the Navy, he turned to the Irish Republican Brotherhood, a group devoted to Irish independence, which anted up $6,000 for the 14-foot, one-man vessel. But when the submersible was launched for its first test, no one remembered to insert two drain plugs. The boat sank; there were no injuries, and the craft was salvaged. The inventor's sixth design - the Holland - was a breakthrough. Launched at Elizabethport, N.J., on May 17, 1897, it was 53.3 feet long and could travel at 7 nautical mph submerged and 8 on the surface. It had one torpedo tube and a gun for shooting dynamite charges and carried a crew of five. A gasoline engine powered the Holland on the surface and an electric motor did the job submerged; this dual power system was an innovation copied in subsequent submarines until the nuclear era. 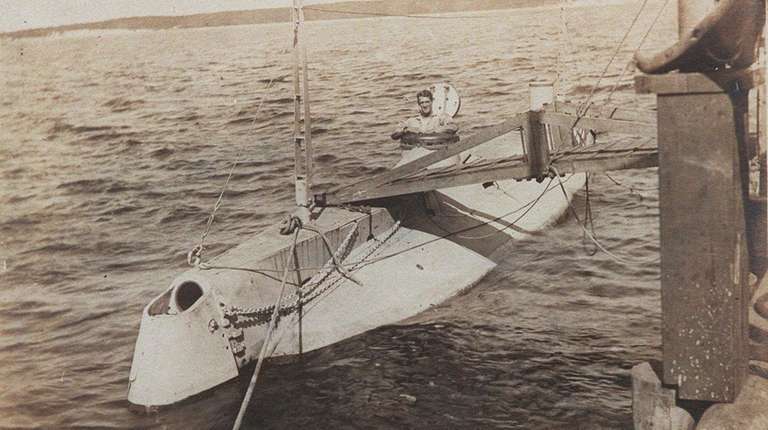 Holland began testing the craft in early 1898 from his base in Perth Amboy, N.J. Morris reported that, "She goes like a fish and dives better than one." With the Spanish-American War looming, both U.S. Navy vessels and Spanish spies watched the ship perform. Assistant Secretary of the Navy Theodore Roosevelt recommended that the Holland be purchased for use in the anticipated war. The Navy demurred, leaving the inventor to continue his tests from a new site in Brooklyn. When Morris suggested that the boat be reconfigured to put the rudders behind the propeller instead of in front of it, an entrepreneur named Isaac Rice went for a test ride and agreed to foot the bill - and more. He bought out Holland and established the Electric Boat Co. Soon afterward, Holland and his new boss arranged for the Holland to be towed down Long Island Sound and around Orient Point to New Suffolk. The Holland was expected to reach Port Jefferson the first night out. But Morris noted in his diary that the towboat crew had brought along a large supply of beer and got so drunk that he decided to stop for the night in Huntington Bay. The two vessels reached New Suffolk the next day. The Long Island Traveler newspaper reported that on June 8 the submarine had reached Greenport, where "many pairs of curious eyes gazed at the strange craft as she came up the harbor . . . The members of the crew have strict orders not to allow any visitors on board." Morris had leased the Goldsmith and Tuthill Shipyard for $10 a month. The arrival of the Holland created a boom for local businesses. "The folk of this sleepy little town saw a chance to make some quick money by raising the rates on room and board," Morris noted. Before New Suffolk, Holland had always been the captain for trial voyages. But Rice beached him. Frank Cable, a young electrician trained by Holland, became the new skipper. Part of the reason may have been Holland's absent-mindedness - he once got lost while walking the two-odd miles from the Cutchogue train station to New Suffolk. A three-mile test course was marked by buoys in Little Peconic Bay. The Holland took naval officers and VIPs on demonstration runs. Most were uneventful. But on July 23, 1899, one of the passengers was Clara Barton, the feisty 77-year-old founder of the American Red Cross. Barton scolded Holland for inventing what she called "a deadly instrument of war." Holland replied that submarines could act as a deterrent to future conflict. The most memorable test run occurred Oct. 11, 1899, with two U.S. senators on board. A gasket failed and exhaust fumes overcame crew and guests. The Holland glided unmanned into the dock. Employees ashore secured the vessel and revived those aboard. From then on, skipper Cable carried caged mice along. "When the mice died, it was time to go ashore," he said. Despite the Holland's good performance, the Navy still wouldn't buy it. So the company decided to send the vessel to Washington to sell itself. The 500-mile trip - made through inland waterways because no insurance company would underwrite an ocean voyage - generated banner headlines and curious crowds. After an overhaul in the Washington Navy Yard, the Holland was put through trials in the spring of 1900 in front of VIPs including Adm. George Dewey, hero of the Spanish-American War. Its performance convinced the Navy to purchase the Holland. It paid $150,000 even though the company had invested $236,615. With a Navy crew aboard, the Holland proved itself against surface vessels in maneuvers off Newport, R.I., and was commissioned into the Navy as the Holland on Oct. 12, 1900. Lt. Harry Caldwell became the U.S. Navy's first submarine captain. The Navy agreed to purchase six new submarines patterned on the Holland. Five of them - the Adder, Moccasin, Porpoise, Shark and Fulton - were tested in New Suffolk until Electric Boat moved to Groton, Conn., in 1905. Now part of General Dynamics, it's still there building nuclear submarines. The Holland, later renamed SS1, served as a Navy training vessel until 1910. Later, it was a traveling exhibit and a park display before it was purchased for $100 in 1930 and broken up for scrap. In 1904, John P. Holland left Electric Boat and set up a new company. He built two submarines for Japan that year but continued opposition from his former employer and the Navy thwarted his efforts. He lived unnoticed in East Orange, N.J., until his death in 1914. Holland was called the "Father of the Modern Submarine." His principles were adopted in U.S., English, German, Russian and Japanese submarines. The boatyard in New Suffolk is now vacant except for one building that was used by Holland. But the only indication that it served as America's first submarine base is a historical marker at First and Main Streets.